Product quality management starts before the products reach production stage. The company regularly performs partner audits, acknowledges only trusted suppliers which follow the requirements, and select appropriate raw materials before they reach the company. All purchased raw materials have to follow high quality requirements and they are purchased only if their quality is not lower than required. Long-lasting and strong cooperation with raw material suppliers around the world lets us choose the right high-quality raw materials for an appropriate price and to get them on time. All imported raw materials are tested according to the agreed control plan in the accredited laboratories in order to guarantee the highest quality and food safety standards. 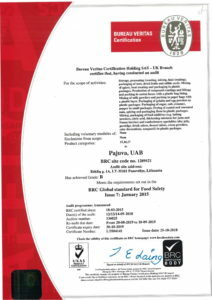 In 2015, UAB Pajuva was recognised as fulfilling BRC (world food safety) standard requirements and it was awarded a BRC certificate. The certificate confirms that the company is controlling the quality in every step: from acquiring the raw materials to allotting products for clients. A worldwide food safety standard BRC is one of the most effective means allowing a company to choose qualified suppliers while minimising the overall supply chain management expenses, increasing safety level for clients, suppliers and consumers, and giving the possibility to improve the processes by implementing new technologies.